The saga between Tesla and the Chinese government is indicative of the balance of power between a country that has built its economic success on the control of not only tariffs and investments, but also of the domestic industrial structure and an innovative company in the new energy vehicle industry that tries to penetrate the Chinese market. From the outcome of the challenge, we will understand how much China still needs Western technologies and how much it considers itself self-dependent. The Chinese government is serious about electric vehicles, and facts always follow the words, with a business plan that targets in 2025 the production of 7 million electric vehicles a year, compared to just under 800,000 in 2017, the first country in the world for the sale of electric vehicles for the last three years. From this, it follows that in 2025 around 35 million electric vehicles will circulate in China. To achieve these goals, China has a system of incentives for both producers and consumers. Incentives for producers include credits – somewhat similar to the current system of carbon credits – for the production of cars with higher energy efficiency and credits for the volume and types of vehicles produced and disincentives for those, instead, that will continue to produce more than 30 thousand combustion cars. Interesting and specific to China, those who buy an electric car, for example in Shanghai, have the right to the precious license plate of Shanghai, which will allow him to drive freely and overcome the restrictions that otherwise limit the circulation for those who come from outside the city. In China, the system works as if those who had the Rome license plate need to park the car at the gates of Milan. Some second-tier cities even issue a residence permit, Hukou to those who buy an electric car, a residence permit that is also regulated in China, which entitles to various benefits such as health care, access to schools for children and more. At the moment all the producers of non-Chinese cars can produce in the Chinese territory only through 50-50 Joint Ventures with a local partner. While imported cars are subject to duties of around 25%. Therefore, a foreign operator has two choices: a) produce abroad with 100% of the ownership, but be subject to import duties, or b) produce in China, avoid duties, but share profits, management and, attention, know- how, with a local partner. 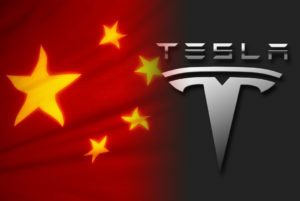 Tesla had hoped that the Chinese government would make special concessions to allow production in China without the need for a partner and it was believed that setting up a production center in the Shanghai Free Trade Zone (SFTZ), with 100% Tesla ownership would circumvent the problem, which turned out to be a chimera, because once sold on Chinese territory, the cars would have been subject to same import duties. Tesla is therefore in the difficult situation to choose whether to produce in China, but risk seeing its know-how slowly pass in the hands of the partner who, when it will no longer need it, will dissolve the JV without thinking too much about it (see the Danone -Wahaha case). The Chinese Industry and Technology Minister has announced that restrictions for foreign JV will be relaxed, but gradually. I add, with the slowness necessary for the local partner to be able to learn. Alternatively, Tesla will have to continue producing abroad and be subject to duties that make it uncompetitive vis-à-vis domestic producers. To make things even more complicated, it seems that only batteries produced in China can be installed on electric vehicles circulating in China, so Tesla should give up their batteries (Panasonic) and use those produced by CATL, which, in China, has a monopoly for the production of lithium batteries. The third way for Elon Musk would be to completely give up on China. It is clear that all these rules can be changed in one day if the Chinese government decides to do so. But it will not do it, and even if it did it could also be a trap for Tesla, since even a theoretical and unlikely 70-30 Joint Venture would allow the minority partner access to all the know-how. China has decided, as written in clearly in its China Manufacturing 2025 plan, that the green economy is among the priorities, the diffusion of electric vehicles among the priorities of the priorities, and the establishment of national champions in the renewable energy sector, in the production of electric vehicles perceived as the culmination of the revenge of the country’s industrial system which, after creating wealth for 40 years but polluting the nation, now moves on to the second phase: cleaning up and becoming the greenest country on earth. Maybe Musk’d better keep his industrial secrets for himself and, alas, give up this big market, at least save the rest of the world market for himself. Until, in a few years, Chinese energy vehicles become more efficient than Tesla’s ones and will conquer the rest of the world.